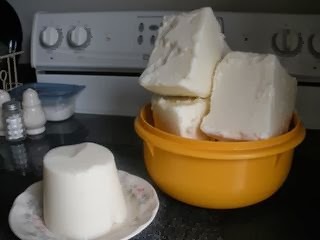 Sometimes instead of using the usual palm oil as my major base oil in my soap, I will use beef tallow. Tallow makes a great addition to my soap, makes it nice and hard, and gentle on the skin, too. It is also more cost effective than some of the other oils. 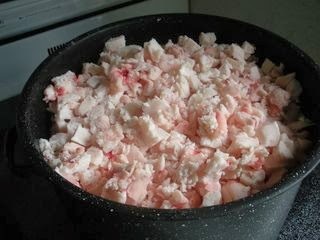 I buy my beef suet for about 10 cents a pound from a local butcher and render my tallow myself. 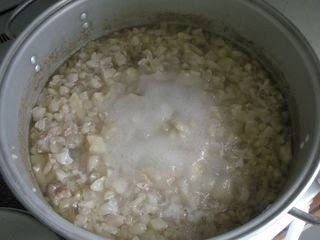 It's an easy process...I set aside an afternoon every couple of months or so, and render up a batch of beef tallow. So, follow along, and I'll show you how it's done. 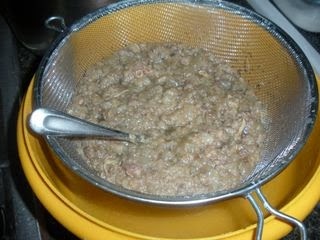 Right here you see 10 pounds of beef suet in the pot after I chopped it up into little pieces. (Phew! What a job!) Do what I do now, and have the butcher grind it up for you when you order it. 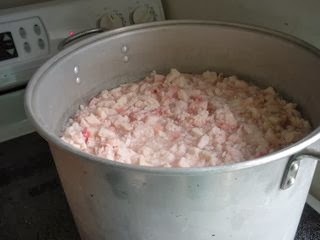 Here is all that suet now in my big old canning pot, because 10 pounds of beef suet is a LOT of beef suet, and it just wouldn't fit in that other pot. Add enough water to cover the suet, and 1 tablespoon of salt per pound of suet. Then fire up the heat! Here it is, bubbling merrily away! It doesn't smell like a meat loaf in the oven, but it can be kind of stinky, so put the fan on over the stove or open the windows if it's nice outside. Let it boil until all you see are bits of gristle and meat floating around in the liquid. Alrighty then, it's time to strain out all that crap! The picture doesn't show this, but I lay an old tea towel in a colander over a bowl to catch the liquid. I then pour it a second time through a clean old gauze diaper or layers of cheesecloth. This gives you a whiter, cleaner tallow. This what it looks like after being strained. Let it cool to room temperature, then put it in the refrigerator to harden. The clean tallow will rise to the top, and the impurities will sink to the bottom. Here it is, after sitting in the fridge overnight. 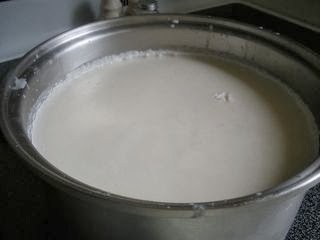 Now to get that tallow out of the pot! 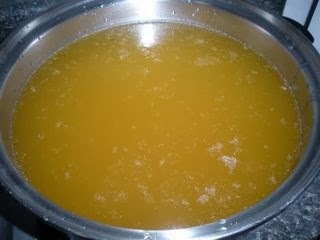 This was one stubborn batch to get out of the pot. I had to cut it in quarters to pry it out with a knife. 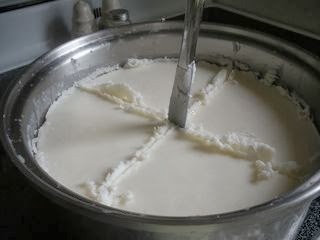 Once you get it out of the pot, rinse off or scrape any debris on the underside of the tallow. If you are still seeing little specks of meat in the tallow, melt it down again, and let it harden. Any remaining specks can then be easily scraped off.